George Thomas Rayner and Sidney Frank Rayner were the first and third sons of Thomas and Rhoda Rayner (nee Miller). Despite research in a variety of sources, details of their military service remain sketchy. The fact that Sidney sadly died while serving in the UK with an Agricultural Company of the Labour Corps allows some more defiinite understanding of his service to be derived. For George, we have little more than the details given in the association roll of honour to go on, which states that he served with the Royal Fusiliers. There is only medal index card for a George Rayner in the Royal Fusiliers, but there is no means of definitively tying that card to this George Rayner. Thomas and Rhoda married in Godstone, Surrey on 7 June 1880. Godstone was Rhoda’s home town, but Thomas was living in the Parish of St Saviour (possibly Southwark, but it’s not readable on the image of the register, and the second letter looks more like an h) and was originally from Sutton. Thomas was a cab driver, and his father a coachman. Rhoda’s father was a labourer. Rhoda was 32 and Thomas just 25. George Thomas Rayner was born just six months later on 12 December 1880 in Sutton. He was baptised at Benhilton on 3 April 1881, which was also the day the 1881 census was taken. The family were then living at 4 Claremont Terrace, Lind Road, Sutton. The census shows that there was another family, the Townsends (husband, wife and three children) living at the same address, though a separate household. A second son, Henry William, was born on 30 August 1882 and baptised on 3 December 1882. Sidney Frank followed in late 1884 – no precise date has been found. By 1891 the family were living at 6 Elm Grove, Sutton. Thomas was then working as general labourer; the three boys, now 10, 8 and 6, were at school. The family were still at the same house in 1901. Thomas had now returned to cab driving, while the older two boys were working as grocer’s porters and Sidney as a stationer’s porter. William Henry Rayner married Beatrice Shiner in 1907 in the Steyning Registration District, Sussex. It seems to have been after this that the other two brothers learnt to ring. The first reports of their ringing are form late 1909 when Sidney rang the treble to a peal of Grandsire Triples at Benhilton on 10 November. It is not noted as being his first peal, so he may previously have rung one elsewhere which has not yet been identified. Both rang in a quarter peal of Grandsire Triples at Benhilton on 29 May 1910, Sidney on the third, and George on the fifth. Sidney rang his first peal inside (on the second) at Benhilton on 9 November 1910, again of Grandsire Triples. At the 1911 census on 2 April 1911 both Sidney and George are listed as grocer’s porters, their father, Thomas had returned to cab driving. This census also confirms that Thomas and Rhoda had had just the three children. Henry William was in service with his wife Beatrice at the home of the Hoskyns-Abrahmall family, Rubers Law in West Byfleet, Surrey. Throughout 1911 and up to 1914 Sidney and George continue to be reported in a variety of ringing at Benhilton. The last time Sidney is known to have rung is on 24 May 1914 when he rang the trble to a quarter peal of Grandsire Triples for Empire Day. George rang a quarter on 2 November 1914 – this was dedicated to all those who had already died in the war (of course at this time there was no special meaning to 11 November, but much memorial ringing took place around the beginning of November as that is when the ancient feast of All Saints and All Souls fall, and the church at Benhilton is also dedicated to All Saints). At some point in late 1914 Sidney married Ethel M West, the marriage being registered in the 4th quarter 1914 in the Kingston registration district. No precise details have been found so far. Similarly, it is has not been possible to find details of his enlistment into the army, but at some point after December 1915 he went overseas as a private in the East Surrey Regiment. At some point subsequently, after the Labour Corps was formed in 1917, he was transferred to it. His number in the Labour Corps (255944) was not in the initial range of numbers assigned to those who joined the Labour Corps on its formation. Such transfers often followed a wound or sickness which led to a medical downgrade, unfortunately his medal records do not show even which East Surrey Battalion he served with, which makes it impossible to know where he served. On 10 November 1918 – the day before the Armistice – Sidney died. At the time he was serving with 437 Agricultural Company, Labour Corps, which was based near Maidstone, Kent. However, his death was registered in the Malling Registration District, Kent: which was does not include Maidstone (the civil parishes which were included are listed here). He was buried in Benhilton churchyard, within easy sound of the bells he had known so well. The cause of death is not known – nothing is given in the original CWGC registers, although for John Webb (the other Benhilton casualty, also buried in the churchyard), the cause of death is given as pneumonia, probably a consequence of Spanish flu. Possibly it was some sort of accident with the agricultural machinery they would have been using. Meanwhile, George Rayner married Ethel May Galton in Woolwich in late 1916. She was originally from Poole, but in 1911 had been in domestic service in Cheam, not far from Benhilton. The exact place they married has not been found, nor is it clear why the marriage took place in Woolwich, perhaps one of them was working there at the time. He is stated on the original roll to have served with the Royal Fusiliers. There is only one medal index card for a George Rayner serving with the Royal Fusiliers, unfortunately there is nothing to tie it definitively with this George Rayner. Assuming it is the right George Rayner, the associated medal roll entry (shown below), indicates he served with 7th Battalion, Royal Fusiliers in France from 23 October 1918. This medal roll shows the entitlement of Private George Rayner to the British War Medal and Victory Medal. He was posted to a 7th Battalion, Royal Fusiliers in France on 23 October 1918. 7th Battalion, Royal Fusiliers was part of 63rd (Royal Naval) Division. Originally formed of Royal Marines and naval reservists not required for service at sea, the division was formally absorbed by the army in 1916, and a number of army units added to its order of battle. 7th Battalion, Royal Fusiliers had originally been a reserve battalion, employed on home defence and training recruits for front line units. The battalion war diary mentions two officers joining on 24 October 1918, but does not mention a draft of men. In fact, a draft is not listed until 21 November, so it is possible George saw no action at all. However, assuming he did actually join the battalion around 23 October, the battalion was then training at Izel-lès-Hameau, France, a short distance west of Arras. On 1 November they moved roughly north west, to Leforest, east of Lens. This village had been left by the Germans three weeks previously. They arrived at 02:00 on 2 November. After resting that day, the following day, 3 November was a Sunday and was marked by church parade. On 4 November a band played for the local residents in a theatre built by the Germans. This was the first time that the locals had heard the Marseillaise since 1914. 5 November saw another move, south west, to Thiant, and then the following day to Saultain, just the other side of Valenciennes, now just a few kilometres from the Belgian border. On 7 November they crossed the border, spending the night in Angres. They were now closing with the Germans. They had crossed one branch of the Honelles river, and over the next few days (until 10 November) took part in a series of actions knwn as the Passage of the Grand Honelles. the battalion came under heavy machine gun fire on several occasions, and also expereinced shelling, including with gas shells. An officer was wounded, and 50 other ranks. On the 11 November the battalion was at Harvengt (now called Harveng) a little to the south of Mons. At 10:55 they witnessed a cavalry unit capture a German artillery battery, and the final shells it fired were the last to come near them. The Armistice came into effect at 11:00 which was “received with great jubilation by all ranks”. The battalion remained at Harvengt until 26 November, so it was probably there that George heard of Sidney’s death, which must have punctured the celebratory mood so far as he was concerned. They then moved back west to Athis where they remained until 6 January 1919, when they moved north east to Hornu. On 23 January George was posted out fo the battalion. The medal roll dos not show which unit he went to, so it is not clear if he went home to the UK for demobilisation then, or if he went to some other unit still in France or Belgium (or even into the Army of Occupation in Germany). He seems to have returned home by around September 1919 at the latest, he is recorded ringing a quarter peal at Benhilton on 21 September 1919. His first child, Sidney George Rayner was born on 9 January 1921. His first name presumably a tribute to George’s brother. A daughter, Gladys J Rayner was born around 4 November 1922 (the exact date is unclear, but a peal rung on 4 November years later was described as being a birthday compliment to her). Ringing at Benhilton seems to have stopped for a number of years, probably the deaths of Sidney, and also John Webb had some influence, and the physical condition of the bells also seems to have become poor. In 1929 they were rehung, and a new band formed. George does not seem to have returned to the tower immediately, but is reported to have been ringing on 2 November 1930, although there is then a further gap. Several quarter peals and peals are then reported from 1933 onwards. This included ringing to mark the granting of a Borough Charter to Sutton on 12 September 1934. They attempted a peal of surprise, but that failed after about an hour’s ringing, but managed a quarter peal of Grandsire Triples, with George ringing the fourth. On 31 October 1934 there was another quarter peal (again Grandsire Triples), to mark the dedication of a new altar in the church. George was ringing the fourth once more, and now the 13-year-old Sid Rayner is reported ringing the treble. The last recorded ringing by either at Benhilton is a peal on 6 December 1936, this was rung half-muffled to commemorate the sudden death of the vicar while reading one of the lessons during the morning service! At some point after this the family seem to have moved to Poole, the home town of George’s wife, Ethel. Sid seems to have married in the Poole registration district in 1940, and Gladys in 1947. Ethel died in 1947 and George himslef in late 1952. So far no record of any further ringing has been found. Sidney Francis Rayner is commemorated on the war memorial in Benhilton churchyard, and also on the main Sutton memorial. This entry was posted in 1957, 437 Agricultural Company, 7th Battalion, Benhilton, East Surrey, November, People and tagged Bellringing, Benhilton, East Surrey Regiment, First World War, George Thomas Rayner, Labour Corps, Royal Fusiliers, Sidney Frank Rayner on 12/08/2013 by davidunderdown95. Arthur Ernest Plowman was at least the third generation of his family to ring at Beddington. He had progressed far enough in ringing to take part in a quarter peal on Easter Day 1916 (23 April), but he had just turned 18 so was liable for conscription. He attested on 10 May 1916, though he may not have actually begun his training until later that year. He was posted to a Base Depot in France on 29 March 1917, just short of his 19th birthday. On 15 April he was posted to a frontline unit, 13th Battalion, Royal Fusiliers, and seems to have joined them at Izel-lès-Hameau, just under 20km west of Arras on 17 April. The battalion had already been heavily involved in the opening phases of the Battle of Arras and in the early hours of 23 April would rejoin the fray – a rather different day to that which he had enjoyed just a year before. After just under a week of hard fighting he was reported missing, and subsequently his death was officially presumed to have taken place on 29 April 1917. His body was never found, and he is commemorated on the Arras Memorial to the Missing. Arthur Ernest Plowman (who appears to have been known as Ernest) was born at Wallington, Surrey on 15 April 1898. His parents, Arthur John Plowman and Kate Groves had married in the latter part of 1896. Arthur was from a Beddington family, Kate had been born in Newbury, Berkshire. Arthur was already a bellringer at Beddington, following his own father, John Plowman, who had been a ringer from about the time a new ring of bells was installed in 1869 (he was elected to the College Youths in 1878). John died at the age of just 41 in 1893. By 1901 the family had moved the short distance to Croydon, where they were living at 11 Westfield Road, but Arthur was still a regular ringer at Beddington. 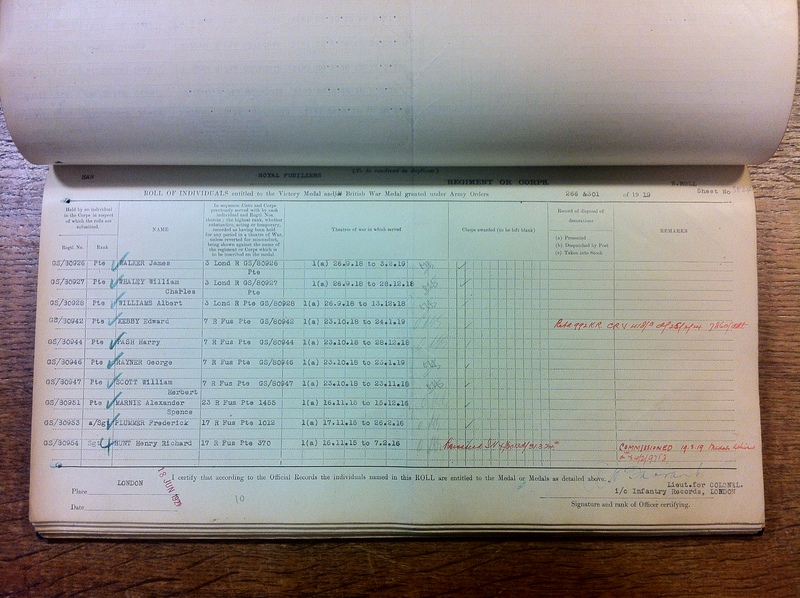 The 1891 census shows that Arthur had originally been an apprentice compositor at a printers, but by 1901 he is described as foreman packer rubber goods. As the 1911 census lists him as a despatch clerk in the cycle and motor trade, the rubber goods were presumably inner tubers, tyres and the like! In 1902 a sister arrived for Ernest, Doris Kate. By 1911 the family had moved again, but an even shorter distance to 4 Ainsworth Road, Croydon. Ernest was educated at the Welcome Hall school in Scarbrook Road, effectively an overflow from the Parish (now Minster) Church School. At some point Ernest learnt to ring, travelling with his father to Beddington. The report of the quarter peal in which Ernest rang the tenor to Grandsire Triples, while his father rang the treble, describes him as “one of Beddington’s youngsters”. Just under three weeks later he would join up, he was recorded as being 18 years 1 month, 5’6″ tall, weighing 131 lbs and having a 35″ chest with 3″ expansion, a painter [this is possibly a mistranscription for printer, see below], born Wallington, attested Croydon, and living 4 Ainsworth Road, Croydon. There is a hint that he did not actually start training immediately, the register entry is marked to say he went to 30th Training Reserve Battalion, but the former 10th (Reserve) Battalion, East Surrey Regiment did not adopt that name until 1 September 1916. The Croydon Roll of Honour states he enlisted on 1 September 1916, which would fit with that being the actual date of his call up. Here his occupation is given as “apprentice to printer’s machine minder”. His posting to France on 29 March 1917 was followed just a month later by his death. A report in The Ringing World in December 1918 does mention his death in passing – it is principally a report of the funeral of Serjeant Major John Webb of Benhilton but as some of the ringers at the funeral came from Mitcham and Beddington their own casualties are also given a mention. However, for some reason, when the Association’s roll of honour was finally drawn up, Ernest was not included. This was despite a statement at the AGM in January 1917, “the number of new members elected during the past year had been four only – against the 50 who had been called too the colours since the outbreak of hostilities. The names of those 50 do not cover the number of ringers of the Association who have exchanged the rope for the rifle, and the Master appealed to the representatives of the towers to see that a complete record was kept, whether members of the Association or not, in order that a complete and permanent record might hereafter be prepared.” (Ringing World 2 February 1917 p37). A century on, it seems just he should also be listed amongst the losses to ringing in Surrey. He should also be added to the Central Council for Church Bell Ringers roll of honour. He is listed in the Croydon Roll of Honour. The Wallington War Memorial apparently lists H Plowman, it is possible this should be Ernest, there was a Horace Plowman living in Wallington in 1911, but there does not seem to be a matching CWGC entry. This entry was posted in 13 Battalion, April, Beddington and tagged Additional, Arthur Ernest Plowman, Beddington, Bellringing, First World War, Royal Fusiliers on 09/05/2013 by davidunderdown95.